Here it is. I am very honoured. Only someone with Oriole Vane Veldhuis’ background, capacity for meticulous historical research and vivid imagination could write a book about the forgotten women of the early Canadian prairie homesteads, reaching into her own family’s past to rescue a history at huge risk of being lost. The author has managed in a unique and interesting way to combine verifiable historical records with an engaging writing style to offer the reader a rich account of some of the settlers who lived in the early and mid-nineteenth century in Manitoba. 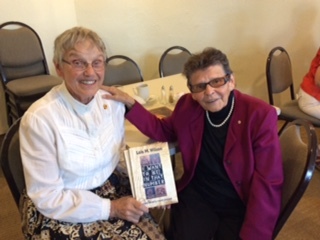 Using the diaries of her great-grandfather, plus a variety of other sources, Oriole has given us a re-creation of the story of her great-grandmother Elise, and thereby given us a window into an oft neglected subject: the splendid contribution made by women to early Manitoba history. It is a story of hardship, hopes, disappointments, betrayals and finally, tenacious survival in a strange new land for the first settlers. It includes intrigue, broken promises and hidden secrets, as well as mundane affairs such as getting through the ordinary events of the next day. It is a long book, which adds to the feeling of endless seeding, planting, watering, and then often, disappointment instead of a bumper crop. The reader is drawn into the endless waiting and often weariness of the prairie settler women who shouldered such an enormous burden of physical work, as well as experiencing considerable emotional deprivation in their marriages. It is through the eyes of Elise, the great-grandmother, that we see the hidden intimate secrets of one family in their struggle for survival and meaning. The author has managed in a unique and interesting way to combine verifiable historical records with an engaging writing style to open her family secret and offer the reader a previously unknown story set in an early settlement south-east of Brandon, Manitoba. You will find the book well worth reading.